Local shares dipped again yesterday - their sixth straight session of decline - as investors tried to get a fix on the many issues creating global uncertainty. One bright spot was news that China and United States officials have discussed the next stage of trade talks. It cheered the Hong Kong and Chinese markets - the Hang Seng gained 0.1 per cent and the Shanghai Composite added 0.4 per cent. But other issues troubled markets, including British Prime Minister Theresa May's decision to call off yesterday's parliamentary vote on her Brexit plan. Mrs May faces an uphill battle in seeking changes to the agreement, as the European Union has said it is ready to discuss how to ease ratification in Britain but not to renegotiate the deal. Meanwhile, Reserve Bank of India governor Urjit Patel resigned on Monday ahead of a board meeting later this week. "Urjit Patel's resignation for 'personal reasons' in fact goes to reinforce the widened rift between the central bank and the government," noted Mr Robert Carnell, chief economist and head of research for Asia-Pacific at ING. He said the government has gained greater control of the central bank and its reserves, and whoever replaces Mr Patel will be under intense pressure to implement more growth-friendly policies ahead of the general election next year. "The news is clearly a significant negative for the markets; even Moody's deplored it as being credit negative," said Mr Carnell. Markets in Japan and South Korea closed lower, as did Singapore and Malaysia. On the other hand, Australian shares ended higher, although the S&P/ASX 200 hovered close to two-year lows. The Straits Times Index (STI) closed down 0.43 per cent or 13.16 points to 3,059.28. About 1.07 billion shares worth $939.6 million changed hands. Ezion Holdings was the most active for a third straight day, falling 7.4 per cent to 0.05 cent on a volume of 70.4 million shares. China Star Food Group was another heavily traded stock. 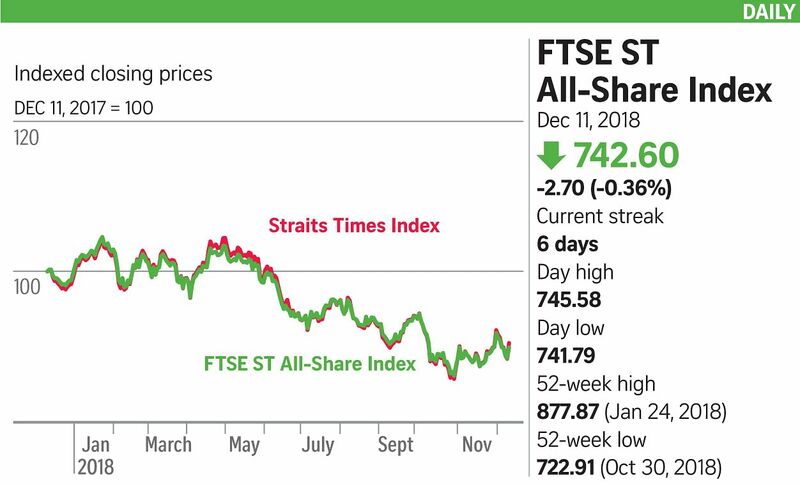 It announced late on Monday it is proposing a one-for-one renounceable rights issue at 1.5 cents per rights share, with net proceeds to go towards a partial capital contribution for a China subsidiary as well as working capital in Singapore. The sweet potato snacks maker closed 35.9 per cent down at 2.5 cents on trade of 32.3 million shares. Several real estate investment trusts rose after KGI Securities' research department highlighted them as favourites in a morning report.